Enhanced Abilities: Skallox has enhanced strength, agility and endurance due to his Red Power ring. Red Power Ring: The Red Power rings use red energy, supplied by a power battery, which in most cases takes the form of red light. The power ring can be used to fire blasts of rage energy. This power is unique as it takes the form of rage-energized blood. The power ring can project this blood from either the mouth or focused through the ring. This blood has the effect of bursting into flames of rage, these flames burn even in space and are so powerful as to burn through the energy auras of opponent ring wielders and corrupt their power rings, depleting them at an accelerated rate. The weapon's power is more an indication of the rage of the user, rather than his willpower. 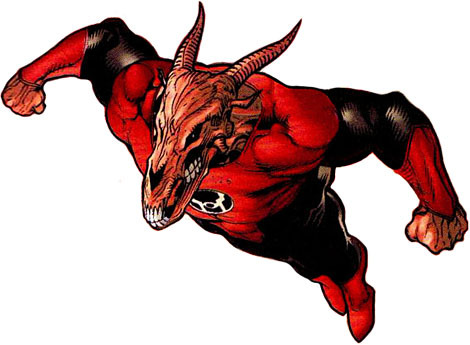 Skallox is a member of the Red Lantern corps. The Red Lantern Corps was formed by Atrocitus of the Five Inversions, one of the five survivors of the massacre of Sector 666. Using the blood magic’s of the Five Inversions, Atrocitus harnessed the red spectrum of light, allowing him to empower the rage within him. The Red Power Ring was born out of anger and crystallized the blood of the Inversions. Atrocitus' first discovery of the red spectrum came during the years of incarceration he endured on the prison planet of Ysmault. He blames the Guardians of the Universe for the massacre of his sector, and because of this, Atrocitus built up years of hatred and rage. When he gave in fully to his rage, it was given shape for the first time when he bludgeoned Qull to death, one of his fellow survivors, with a Red Lantern Power Battery. After that, Atrocitus apparently killed the other Inversions, using their blood as part of his plans. He then poured forth the great bloody rage drawn from his body by the power of the red spectrum. Using blood magic’s, he forged a Central Power Battery of his own which stands before a great lake of blood, and from that Lantern emerged batteries and rings to power the Red Lantern Corps. In the shadow of the great Red Lantern, immersed in his victims' blood, Atrocitus vowed revenge against the Guardians of the Universe and Sinestro, the "Greatest of the Green Lanterns" and the one who incarcerated him. He began sending rings across the universe, hoping to raise an army and destroy his jailers. However, upon accepting the rings, their hearts were rendered useless and spoiled the blood from within, causing them to expel it in violent manner that burned anyone who touched it. Additionally, the Red Lanterns were reduced to an almost animalistic state.